I can be a vulture when it comes to candy. I have a predetermined list of stores I scout out weekly and gaze upon their candy sections. Supermarkets, drugstores, gas stations, etcâ€¦. I usually do this to see if there happens to be a sale on candy, or even if I know there is a new product debuting that I should keep an eye out for. You can imagine my surprise whenever I discover a new candy product that I wasnâ€™t expecting. Yes, this is a rarity, but it happened this past week at a Walgreens. As if it was supposed to be stocked with all the other theater-sized box candy, a new version of Mike and Ike stood among its cousins of Tangy Twister and Jolly Joes: Italian Ice. I knew to expect the release of Lemonade Blends a few months back, but nowhere had I heard about Italian Ice debuting. In fact, it isnâ€™t even listed on their website. Quickly, I purchased the box along with a box of the new and original Tropical Typhoon, which boasted an assortment of new flavors, as advertised on its box. The first thing I noticed about the Italian Ice version is that itâ€™s much lighter than other boxes. The pieces are smaller, and the box contains fewer of them (this box had three servings while the Tropical Typhoon yielded four). In fact, the entire box contained only 420 calories, which is fewer than most king-sized candy bars. The second thing I noticed was the beautiful art design of the box. As far as theater-sized candy goes, this box is a good deal smaller than normal ones. Its pictures are set against a sky-blue background, and all the images are simple in their craft. This version is essentially the original five minus strawberry and lime, which are replaced by the 90s flavors of blue raspberry and watermelon. Lemon: Not citrus-infused, even a little sour, but it tasted very much like a Chewy Lemonhead, despite the slight grain in the piece. Lemon was my favorite of the bunch. Orange: I donâ€™t taste a citrus zest here indicative of true orange, and the piece is somewhat bitter, though subtle in its flavor. Cherry: Strong artificial cherry, but in the best possible way. I was reminded of the cherry Tootsie Midgee. It resembled the flavor of a cherry snow cone, which is the most â€œItalian Iceâ€ one can expect. Blue raspberry: There is a slight sour kick to it, but it comes off being a genuine blue raspberry flavor; I donâ€™t know if that says much considering itâ€™s a concocted flavor. Watermelon: I tasted a slightly sour overtone, but nothing overpowering. It resembled the flavor of watermelon Bubble Yum. As a whole, I think these definitely peak near the top of the Mike and Ike line. They are way better than the original, and their intensity falls between the Original and Zours. Because it was a new product, all the pieces were incredibly soft, and it was nice not losing a filling to a Mike and Ike for a change. I both enjoyed and recommend these to anyone. 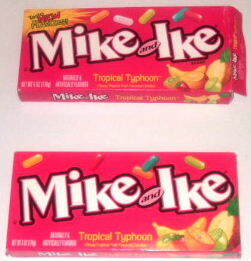 Tropical Typhoon was a great Mike and Ike spinoff. I say was because old the version consisted of Orange-Pineapple, Strawberry-Banana, Kiwi-Lime, Caribbean Punch and Pineapple-Banana. I adore pineapple and think itâ€™s a very underrated flavor in the American confectionery diet. Caribbean Punch: This version is sweeter than the original, containing a better burst of flavor, which is an unidentifiable form of punch. Itâ€™s a firmer piece than the original, but not in a stale manner. I preferred this one to its original counterpart. Mango: I taste tangerine, with notes of guava and nectar, but little if any mango. The citrus and acidity in the chew obscure any that is in it. It isnâ€™t bad, but itâ€™s not mango. Strawberry-Banana: Unlike the original, which is concentrated around the banana with hints of strawberry, this piece was more strawberry, less banana. I prefer banana to strawberry so I was disappointed in this one, missing the original. Kiwi-Banana: I think Kiwi and Lime work well together, which is why I never minded these in the original version; however, the banana is more potent than lime, and even worse, it doesn’t compliment the kiwi flavor. Paradise Punch: There is a soft punch flavor, more indicative of a classical fruit punch they serve at junior proms than the Caribbean, which retained traces of exotic elements. Overall, these disappointed me. It wasnâ€™t that these werenâ€™t good, but that I much preferred the original. Maybe itâ€™s just me and others will adore the fewer pineapple pieces. Of the two, the Italian Ice is the superior product, and if you had to pick only one, I say go for those. My only hope is the Just Born people read this a create a mango-pineapple flavor for the next release. i never buy these because they always seem too sweet. the italian ice variety sounds pretty good. if there’s more sour, then maybe that’ll cut the sweet some. I’ll be on the look out for the Italian Ice ones. They sound good! 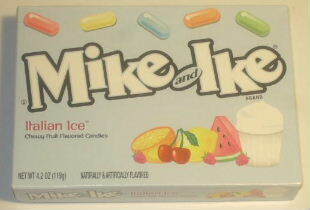 They sound sort of like a candy I vaguely remember… I think they were sort of a Mike & Ike knock-off of some sort. 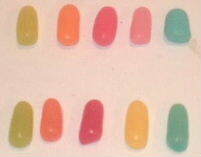 I just remember they were a lot more sour than Mike & Ike’s, and the coating on all of them was almost opaque white so you could barely see the color of the gel in the middle. These are not too sweet they’re just right. 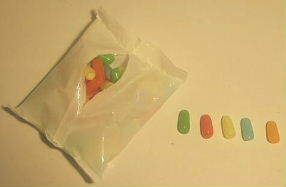 My favorite Mike and Ikes were the Jolly Joes (all grape) but they got discontinued. Tropical Twister and Italian Ice round out the rest of my faves.